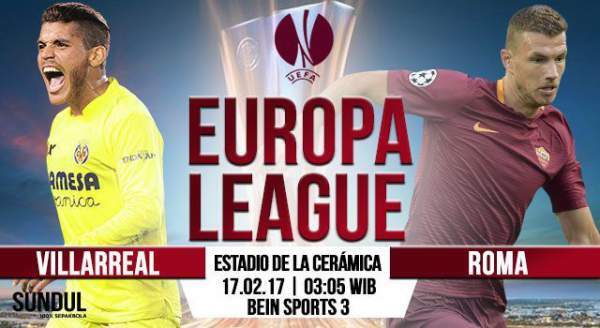 Villarreal vs Roma Live Streaming Europa League Score Football: Villarreal hosts Roma for the first leg of the Round of 32 stage of Europa League at Estadio de la Ceramica. Villarreal plays in the Spanish Primera Division and is currently sixth on the table with 36 points from 22 games, five points below Real Sociedad and one point above Eibar. On the other hand, we have Roma who plays in the Italian Serie A and are currently second in the table with 53 points from 24 games, six points below Juventus and two points above Napoli. 17th February 2017 at 01:35 (IST). Estadio de la Ceramica, Villarreal, Spain. Watch: Manchester United vs St Etienne Live – Europa League 2017. Villarreal is sixth on the table with nine wins, nine draws and four losses, scoring 29 goals and conceding 15. Nicole Sansone is their top scorer with seven goals to his name. Villarreal has faced Roma once before in the 2003/4 fourth round. Villarreal has only lost once and drawn once against Italian sides, winning seven times. They have drawn four games and won once in their last five games in the league. They played against Malaga in their previous game in the league and drew the game by 1-1. Villarreal got to the semi-finals last season where the met Liverpool and was knocked out by the English side. Roma is going strong in league with 17 wins, two draws and five losses in the 24 games they have played till now, scoring 50 goals and conceding just 21. Edin Dzeko is the league’s top scorer with 18 goals to his name, also having five goals in the Europa League so far and Mohamed Salah is their top assister in league with six assists to his name. On Spanish surface Roma has just three wins and three draws, losing seven games. Roma has won four games and lost one in their last five games in the league. They played against Crotone is their previous game in the league and won the game by 0-2 with ease. Both teams have won their previous games in the league and are in good form.